Gruff is becoming all arms and legs. Bonnie doesn’t mind her friend getting bigger, it just means those stick throws get longer and better. 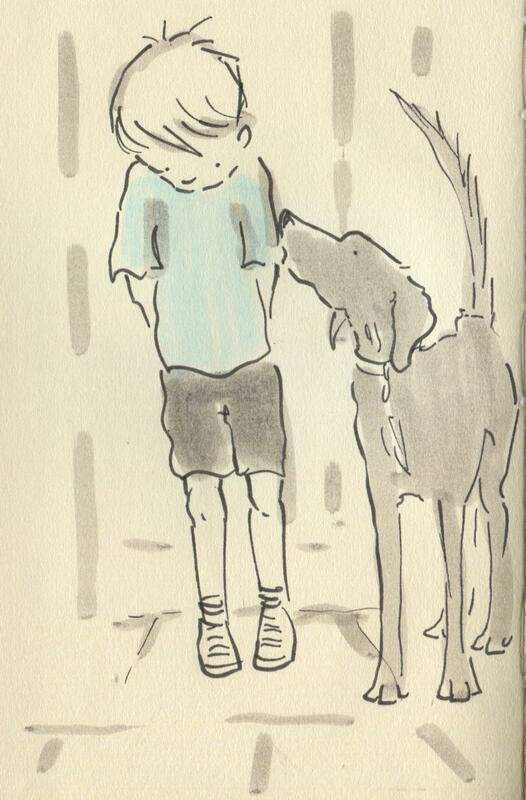 Posted on July 7, 2014, in Uncategorized and tagged Children, Dogs, Doodlemum, Drawing, Family, Humour, Illustration, Life, Pen and Ink, Sketchbook. Bookmark the permalink. 6 Comments. Is that’s why he’s being falling over so much, recently? It’s hard to remember where your feet are, when you’re growing- a quick check now and then is a very good idea! Is this the end of his nursery year, too? Soon you’ll have a big boy going to big school- gulp!